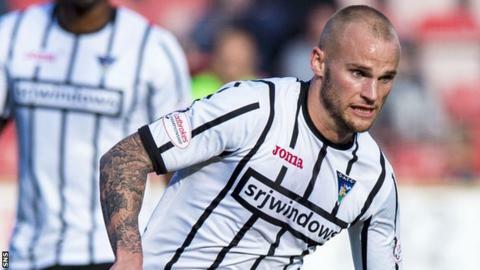 Dunfermline leapfrogged Livingston into second place after a Kallum Higginbotham double at East End Park. The Pars took a bizarre lead when goalkeeper Neil Alexander's clearance rebounded into the net off Higginbotham. Fraser Aird made it 2-0 and then set up Higginbotham to score his second and the Pars' third before the break. Nicky Clark hit the post, while Danny Mullen missed a good chance before finally turning home a consolation. Match ends, Dunfermline Athletic 3, Livingston 1. Second Half ends, Dunfermline Athletic 3, Livingston 1. Corner, Livingston. Conceded by Lee Ashcroft. Attempt blocked. Daniel Mullen (Livingston) left footed shot from the right side of the box is blocked. Shaun Byrne (Livingston) is shown the yellow card for a bad foul. Corner, Livingston. Conceded by Callum Morris. Goal! Dunfermline Athletic 3, Livingston 1. Daniel Mullen (Livingston) left footed shot from the right side of the six yard box to the bottom right corner. Assisted by Nikolay Todorov following a corner. Corner, Livingston. Conceded by Kallum Higginbotham. Attempt missed. Daniel Mullen (Livingston) right footed shot from outside the box is close, but misses the top right corner. Substitution, Dunfermline Athletic. Andy Ryan replaces Calum Smith. Substitution, Dunfermline Athletic. Joe Cardle replaces Fraser Aird. Foul by Aaron Splaine (Dunfermline Athletic). Nikolay Todorov (Livingston) wins a free kick in the defensive half. Fraser Aird (Dunfermline Athletic) wins a free kick on the left wing. Aaron Splaine (Dunfermline Athletic) wins a free kick in the defensive half. Foul by Jack McMillan (Livingston). Attempt missed. Nikolay Todorov (Livingston) header from the left side of the six yard box is close, but misses the top left corner. Corner, Livingston. Conceded by Ryan Williamson. Foul by Nicky Clark (Dunfermline Athletic). Attempt missed. Aaron Splaine (Dunfermline Athletic) left footed shot from outside the box is close, but misses to the right. James Penrice (Livingston) is shown the yellow card for a bad foul. Kallum Higginbotham (Dunfermline Athletic) wins a free kick in the attacking half. Foul by James Penrice (Livingston). Foul by Nikolay Todorov (Livingston). Attempt blocked. Aaron Splaine (Dunfermline Athletic) left footed shot from outside the box is blocked. Corner, Dunfermline Athletic. Conceded by Neil Alexander. Attempt saved. Nicky Clark (Dunfermline Athletic) header from the centre of the box is saved in the top centre of the goal. Attempt missed. Nicky Clark (Dunfermline Athletic) right footed shot from outside the box is close, but misses to the left.